Cotton/Polyester sewing thread from Ikea on Pineapple fiber-silk handwoven fabric from the Heritage Arts and Crafts, Philippines. This is my entry to the joint project of the German Embroidery Guild and the Lace Guild, the competition “Fadenkreuz” in 2010. 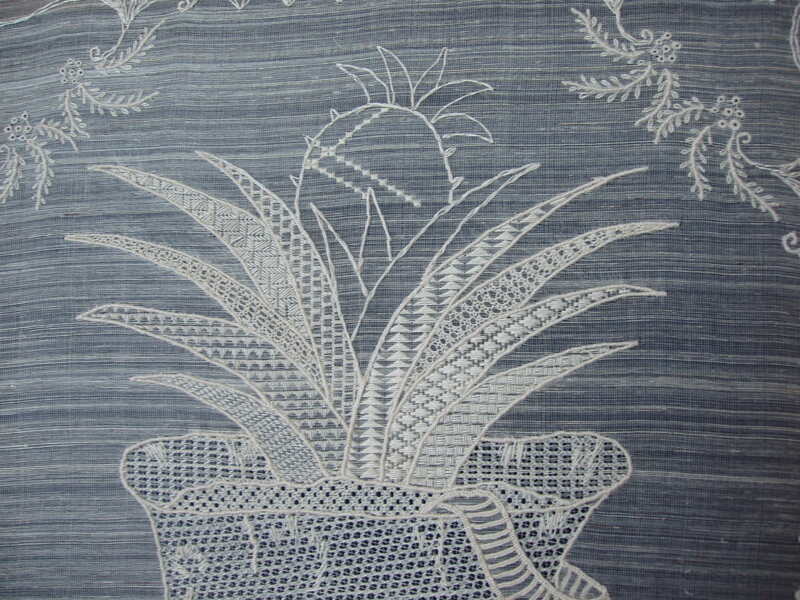 The theme is to combine embroidery with handmade lace, either embroidered or pillow lace (bobbin lace). Heiwa is the japanese word for peace. The worn-out, old WWII japanese army helmet symbolizes peace, which we experience when there are no wars. Japanese soldiers brutally killed many innocent Filipinos during the WW2. The handkerchief symbolizes the tears of pains and loss that were shed by loved ones. In the Philippines, the legend of the pineapple teaches children to refrain from pretending not to see truthfully. A bad girl named Pina met an accident, because she kept pretending not to see what her mother asks of her. On the earth where her body lie, a strange plant with many eyes grew. The people named the plant after Pina, and called it “Pinya”. The pineapple´s eyes symbolizes seeing truth and knowledge. I planted a pineapple on the helmet, because it means we should see the truth behind wars, and know that peace is what the world needs. Heiwa Hankerchief is a message of peace, and this I kept in mind while stitching this project. 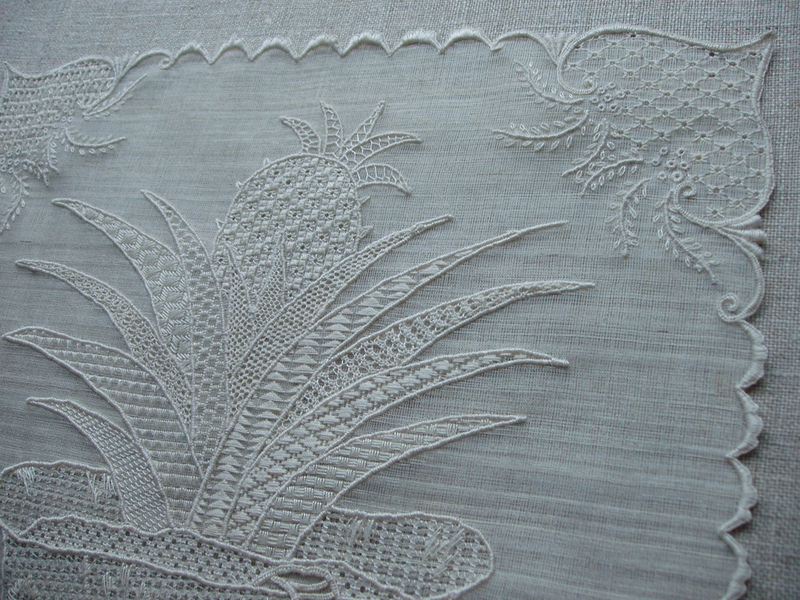 I painstakingly embroidered various stitches using polyester thread on a very special and rare fabric made of silk warps and of pineapple fibers wefts from the leaves of Red Spanish variety pineapples, and handwoven in Aklan Island, Philippines. The first WIP photo. I am quite satisfied. I am learning a lot regarding techniques. I have never done this so fine embroidery. My eyes are like bleeding!!! Nov. 18, 2009 Update: Starting the pineapple, the leaves almost finished, all silk paper are removed and the handkerchief is transferred on a new frame. Finally, it is ready for the competition. I wanted to come up with a traditional lace handkerchief from the time of the Spanish occupation in the Philippines, using the antique patterns of scalloped edges and sprays. I wanted the design to be ornamental, so that one can hang it on display, without losing its message. The design is also strange enough to start conversations. 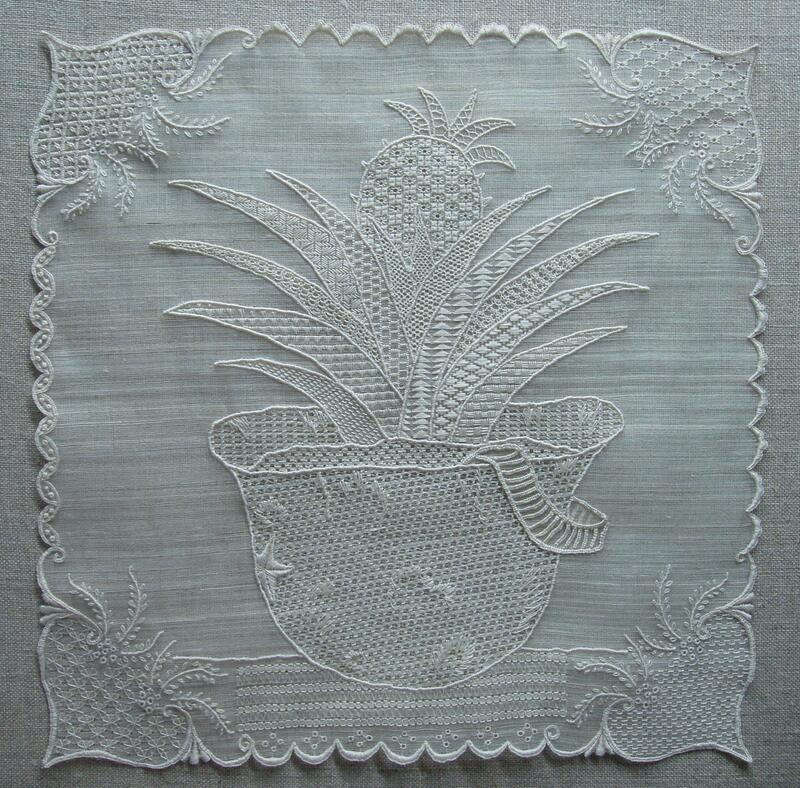 There is enough craftmanship in it to attract both experts and laymen in needlework . This work is very precious to me. It does not have to win a prize. I believe by finishing this, I already won. I am thankful to the competition for giving me the chance to explore my creativity.